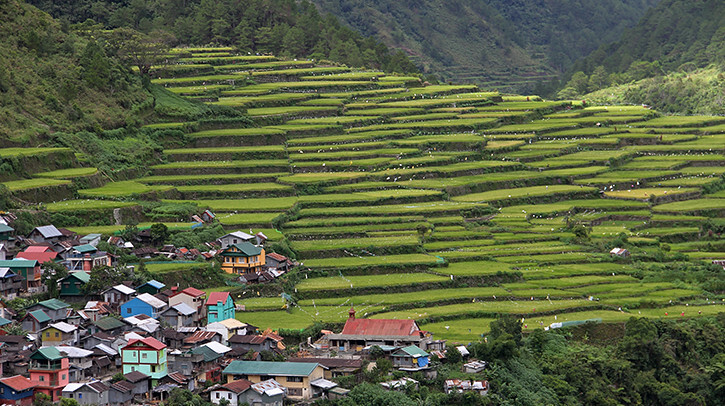 Of the many distant communities nestled in the Cordillera mountain range of the northern Philippines, Upper Tinglayan is among the most remote. No one would happen upon it. You have to work to get there. We traveled by four-wheel drive vehicle around hairpin turns, over potholes as deep as our wheel wells, bouncing along roads that would probably not turn into landslides under our feet, but might. At each turn, our driver tapped the horn to warn unseen vehicles that we were coming. We dodged fallen boulders and potholes, the bounce could knock the fillings out of your teeth. After a few close calls, we reached Butbut Proper, a village of some 35 families and maybe 150 people. The neighboring village of Luccong is another mile or two up and around the mountain, reachable by a footpath that affords spectacular views and requires attention and good balance. The two communities share a long history of living on this mountain. One hundred years ago, their Igorot ancestors warred with rival tribes and occasionally claimed the heads of their enemies. Living high on the mountain, they had the strategic advantage of being able to see invaders coming. Today, Butbut and Luccong share a more peaceful and cooperative point of view. They are both led by the Rev. Barnabus Chaokas (Father Barney), the vicar of the Episcopal mission churches St. Luke’s in Butbut, and St. James in Luccong. Barney, as he is known, presides over two Sunday services and leads frequent Bible studies. And he does a lot of walking back and forth. Father Barney and half a dozen men from the church met us on the edge of the village and led me on a dusty hike onto a ridge where dozens of new pine saplings grow. The Rev. Chaokas waved his hand across the spectacularly beautiful horizon and told me that those trees are the result of an Episcopal Relief & Development program. The community learned about the program several years ago from the Bishop of the Episcopal Diocese of Northern Philippines, The Rt. Rev. Brent Alawas, when he visited to consecrate the church in Butbut. Because of excessive logging over many years, communities have lost vast amounts of their forestlands. That loss contributes to erosion, landslides and soil infertility. The government of the Philippines encourages tree-planting efforts by providing low-cost seedlings and supporting church partnerships. Parishioners created a small nursery to raise seedlings and they planted trees over a 100 hectares area. “The people here love to plant trees,” Father Barney said. Most of the men of St. Luke’s are members of the Brotherhood of St. Andrew, a group whose purpose includes prayer, study and service. They wanted to help support the church through raising cattle, so they asked their bishop for assistance to purchase livestock. They received a loan from E-CARE, the development office of the Episcopal Church in the Philippines and a long-time partner of Episcopal Relief & Development. The men decided the first calf would go to the church, the second to the Brotherhood of St. Andrew and the third to the Receivers to Givers component of E-CARE — those who receive a grant pay it back in part by giving to another community in need. The men manage a herd that numbers fifteen and is growing. The animals graze over a sprawling, unfenced area on the side of the mountain. But they know their human caretakers and they respond to their familiar voices. Father Barney began calling the cattle, and soon enough, the herd trudged our way. Surrounding us, they seemed eager to interact with our group—as if they were on a play date at an American dog park. So we petted them, and tried to avoid swinging heads, swishing tails and the cloud of insects that swarmed around their heads and ours. Trees and cattle are important assets to a remote and resource-challenged community like Butbut. 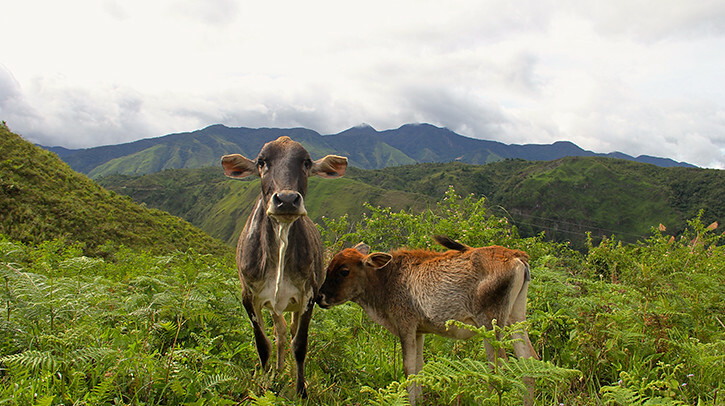 The cattle provide a source of food and capital for a community short on both, and the trees are a significant step in the reforestation of an area prone to landslides. 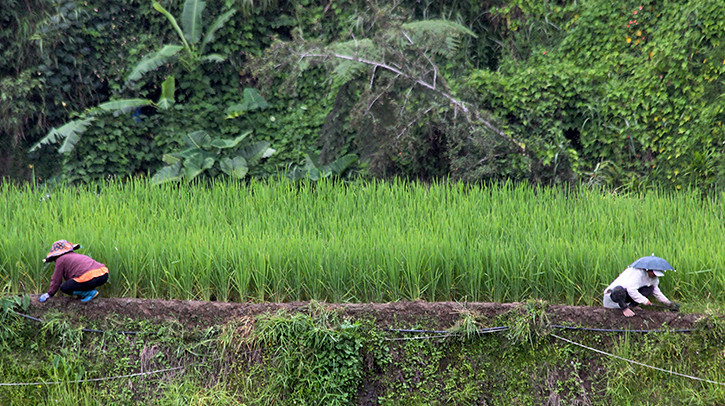 Virtually everyone in the rural northern Philippines is a rice farmer. They have been rice farmers for 2,000 years. And farm-to-table methods haven’t changed much in the meantime. Rice is pounded on a stone to separate it from the husks. The women of Luccong spent much of their time and energy on this physically demanding task. They saw what a difference a rice mill made in their neighboring village. The community borrowed 245,000 pesos (about $4,750 USD) from E-CARE’s Receivers to Givers program, and purchased the mill in 2014. They built a structure to house the mill in 2015 and began paying back the loan almost immediately. They expect to pay it off well ahead of schedule. To earn the money, people do extra work in others’ fields after working their own crops. Everyone signs up for various duties associated with the mill, from actually milling the rice, to bagging and labeling, cleaning up and doing maintenance. Jason Dawing is the mill operator. “He’s honest, so we elected him,” said Loida. Now that they have a little time, what’s next on the wish list for this community? Now they want a vehicle, Loida said, a jeep perhaps, so they can get down the mountain to attend ordinations, ECW meetings or St. Andrew conventions. Mike Smith is a Major Gifts Officer for Episcopal Relief & Development. Top— A man tends to cattle; Middle 1 — Rice terraces spread over the mountain; Middle 2— Father Barney plays with cattle; Middle 3— A cow and calf; Middle 4— Loida Paclay, president of ECW and Florinda Alilom, the group’s auditor, sit in a doorway; Middle 5 — Rice workers in the Philippines. Click below to access our Resource Library and learn more about our efforts around the world.